Paul Heatley hopes Crusaders can continue to dominate the Danske Bank Premiership landscape for years to come. The Crues lifted the Gibson Cup for the first time in 18 years last month. It is only the fifth time the Shore Road men have claimed the Holy Grail of local football. It has been an historic triumph for Stephen Baxter’s side, but wing wizard Heatley insists Crusaders are refusing to rest on their laurels. “We want to go on and win more titles,” Heatley said. “It is great to win the title once, but as players you always want to progress and win more silverware. Heatley was speaking as he claimed the BT Sport Footballer of the Year award at Monday night’s Northern Ireland Football Writers’ Association annual gala dinner. The 27-year-old Seaview star bagged a staggering 29 goals in 41 appearances for the Crues last season. 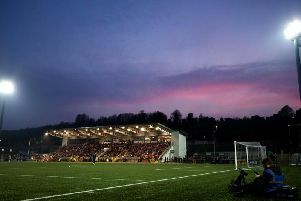 It was a phenomenal return from a winger in the Irish Premiership, and a seismic contribution to Crusaders’ title success. “It has been a long road to reach this stage,” Heatley said. “We won a lot of cup competitions, but we were always the nearly men of the Premiership. “We came close but faded, and it did become a bit frustrating after a while. “So this title success is very special for everyone associated with the club. The players, the manager, the board and the supporters – and everyone else at Seaview. Crusaders dominated Monday night’s awards ceremony. Heatley was crowned top footballer, while team-mate Gavin Whyte was named Young Player of the Year. And in a hat-trick of gongs, boss Baxter was honoured with the Manager of the Year award. “This award comes down to the hard work and effort of a lot of people, not just the manager,” Baxter said. “We got relegated a couple of months after I took over, and it was a difficult period for the club. “Crusaders FC was in danger of closing down completely. Financially, it was a difficult time fot the club. But we battled on. “So to reach this stage, to win another title after 18 years, is fantastic. I am so proud of everyone involved. “When I took over, players like Colin Coates and David Magowan were fresh-faced youngsters getting their break in the game. “They have earned this title success and I am delighted for them, and every other player. “Their loyalty to Crusaders has been rewarded with the Gibson Cup. Teenage winger Whyte also revelled in his Young Player of the Year accolade. It capped off a memorable debut season for the 19-year-old. “I still can’t believe I won this award,” Whyte said. Whyte continues to be linked with a summer move away from Crusaders, as a number of cross-channel clubs monitor the teenager’s position at Seaview. “We will wait and see what happens,” Whyte added.